When I looked back over my blog entries, this one was the most read. So I am re-posting it with a few changes. Abraham planted tamarisk trees at Beersheba. Read Genesis 21:22-34. In about 2091 B.C., God directed Abraham to leave Haran and travel to Canaan. God told Abraham that in Canaan, the Promised Land, He would make Abraham the father of a great nation (Genesis chapters 12–17). When Abraham left Haran he was about 75 years old. He traveled with his wife Sarah and his nephew Lot. After entering Canaan, Abraham pitched his tents between Bethel (on the west) and Ai (on the east). With the exception of a brief time in Egypt, Abraham lived in this region for the next 14 – 15 years. When Abraham was 99 years old, he had a visit from three angels (Genesis chapter 18). The angels announced that Sarah would give birth to Abraham’s son and that they planned to destroy Sodom for the depraved sinfulness of its people. Shortly after Sodom’s destruction, Abraham left the Bethel-Ai region and traveled south into the Negev Desert (Genesis chapter 20). He spent a short time near the city of Gerar (western Negev) where he met Abimelech, king of Gerar. After Abimelech caught Abraham in a misrepresentation, Abraham left Gerar traveling south-east-east in the Negev Desert area. After some days journey, Abraham camped. In this area Abraham and Sarah’s son, Isaac, was born (2066 B.C.) when Abraham was 100 years old (Genesis 21: 1 – 7). With these events in mind, the Bible tells a short but important story called “The Treaty at Beersheba” in which Abraham plants tamarisk trees. The story begins with Abimelech, King of Gerar and his military commander’s arrival at Abraham’s campsite. The purpose of Abimelech’s visit was to elicit an oath from Abraham that he would not “deal falsely,” but with kindness (friendship) toward Abimelech and his descendents. Willingly, Abraham gave Abimelech his oath. Then Abraham complains to Abimelech about a well that Abraham’s men dug and Abimelech’s servants seized. Abimelech expressed surprise – he did not know his servants had seized the well. Because Abraham wanted the well, he gave Abimelech seven ewe lambs in return for Abimelech’s oath that the well belonged to Abraham. The site became known as Beersheba, “the well of the oath.” After Abimelech returned to Gerar, Abraham planted a tamarisk, or a grove of tamarisk trees, at Beersheba. There Abraham called on El Ôlām, naming God the Eternal (forever, everlasting) God. The Bible recorded that Abraham stayed in the area a “long time” (Genesis 21:34). Beersheba is the only place that the Bible recorded Abraham planting trees. Today there is still an ancient well located at, or near, this site called Abraham’s well and tamarisk trees grow in the area. 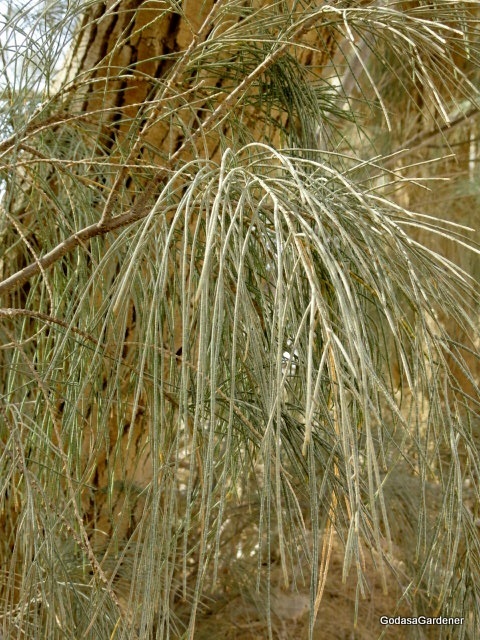 Most botanists and Christian scholars are unanimous in their agreement that the trees that Abraham planted were the Tamarix aphylla. It is also called the athel pine, and athel tree. The tamarisk is a commonly occurring tree in the Middle East and probably originated in semi-arid to arid northern Africa and western Asia. It is evergreen tree and can reach a height of 50 feet. The tree grows needles rather than leaves; Aphylla means “without leaves.” Often needles excrete salt on their surfaces which give the needles a white color. Because the T. aphylla excretes salt, it is sometimes called a “salt cedar.” The tamarisk tree provides shade and a pleasant coolness. At night, moisture increases in the cool air. Water vapor adheres to the salt particles excreted on branches and needles and forms droplets. In the morning tiny droplets of water appear on the thin branches. As the morning sun warms the air, the water droplets evaporate and cool the tree and the shade below it. The water droplets are most plentiful after a humid night and generally evaporate before noon. Why did Abraham plant a Tamarix aphylla or a grove of T. aphylla at Beersheba? The answer could be as simple as Abraham was familiar with living in the high country of Canaan between Bethel and Ai where there were tall trees for shade, coolness and beauty. He wanted to reproduce this environment in his new home. Another answer is that the tree was a memorial to the oath between himself and Abimelech. This reason doesn’t seem as likely because Abraham named the place Beersheba, meaning the well of the oath. This name Beersheba was a reminder or memorial to the oath between Abraham and Abimelech. I believe that Abraham planted the Tamarix trees as a memorial to his re-commitment to El Ôlām, the everlasting God. This interpretation is supported by events in time – Abraham now had the son that God promised, peace with his neighbors, and water for physical life in the dessert. God kept his promises to Abraham; Abraham’s life is filled with blessings. God welcomes individuals who have sinned to turn to Him. In Ezekiel 18: 21- 22 we can read, “if a wicked man turns away from all the sins he committed and keeps all my decrees and does what is just and right, he will surely live; he will not die. None of the offenses he has committed will be remembered against him.” Ezekiel (520 – 480 B.C.) lived 1500 years after Abraham. Abraham didn’t have the benefit of Ezekiel’s instruction; but Abraham was aware that he had sinned by not believing that God would provide a son for him through Sarah and misrepresenting to Abimelech that Sarah was his sister rather than his wife. It is probably that when Abraham called on El Ôlām (Genesis 21: 33), he built an altar and offered sacrifices for his sins (Genesis 12:8). Then, Abraham memorializes his re-commitment to God by planting Tamarix trees. We should not have to think deeply about committing our lives to God. There is ample evidence in the scriptures that God wants His people to be fully committed to Him; and God blesses both nations and individuals who commit to him. Samuel told the Israelites that they must first returned to the Lord and commit themselves to Him, and then God would deliver them from the hand of the Philistines (I Samuel 7:3). Psalm 37:5 reads, “commit your ways to the Lord; trust in him and he will do this: He will make your righteousness shine like the dawn, the justice of your cause like the noonday sun.” Finally, Proverbs 16:3 instructs us to “commit to the Lord whatever you do and your plans will succeed.” The preceding Bible verses are conditional statements, they are If – Then statements. If nations and individuals commit to the Lord, then God will deliver them, and He will make their righteousness shine and their plans succeed. Notice — we must take the first step by committing ourselves and our ways to God. The question is: Why don’t we commit — seriously commit — our ways to God? Do we simply forget to make these commitments? Do we think God doesn’t care about what we do or want to do? Do we think that we can do it ourselves? Whatever the reasons for not committing our ways to God, they are not adequate or sufficient. God is very clear: if we want our plans to succeed, we must commit them to God. Commitment doesn’t mean half heartedly saying to God, “I am going to do_____ (you fill in the blank) and I commit it to you.” Committing ourselves and our plans to God is more than a quick e-mail prayer. Real commitment means taking time to discern with God what His will for our lives entails. Do we stay in our current job or change? Is this the right person for me to marry? Do I buy this new car or get my current one repaired? Committing our ways to God often requires that we do not go with the moment; rather we pause, seek, and reflect on Biblical precepts before making decisions; and we commit the decisions to God. Thought: “The eyes of the Lord range throughout the earth to strengthen those whose hearts are fully committed to him” (II Chronicles 16:9). Do you want to be strengthened by God? What should you change in your life to make this happen? This entry was posted in Plants & the Ancient Fathers and tagged Abraham, Bible Garden, Bible Plants, Bible Study, Commitment, God, God as a Gardener, Israelites, Tamarisk tree. Bookmark the permalink.